Harris-Stowe State University is a member of the National Association of Intercollegiate Athletics (NAIA) and competes in the American Midwest Conference (AMC). 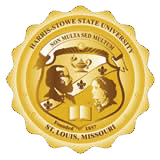 Harris-Stowe State is a charter member of the original Show-Me Collegiate Conference, which became the AMC in 1994. Participation in intercollegiate athletics at Harris-Stowe State University is available in baseball, men and women’s basketball, indoor and outdoor track & field, men and women’s soccer, volleyball, softball and cheerleading. Harris-Stowe State athletics tradition of success includes many fields of excellence including: AMC All-Academic Scholar Student-Athletes, AMC consecutive Conference Tournament Champions, Historically Black Colleges and University (HBCU) National Baseball Pitcher of the Year, NAIA Scholar Athletes, NAIA All-Americans, and Champions of Character Award Winners. Participants in intercollegiate athletics must be full-time students who meet the NAIA eligibility requirements. Athletic scholarships are awarded each year to those student-athletes who demonstrate outstanding academic and athletic ability. Those scholarships are awarded to cover full or partial in-state fees. Additional financial assistance may be available in special cases to cover partial book expenses or housing costs. Because of the financial support provided by the student activity fees, all students are admitted free to intercollegiate athletic events with their Harris-Stowe State University identification card. Students wanting additional information regarding athletic programs and eligibility requirements should view the athletic website www.hornetathletics.com or contact the Athletics Office at (314) 340-5721. The University offers a program of intramural athletic activities to all members of the University community–students, faculty and staff, at all levels. Competition in the various sports is available at both the individual and team levels. Although instruction in the rules and skills particular to the various games is provided, such instruction is not the major emphasis; rather, the program’s main focus is the cultivation of the needed skills for recreational purposes and on the joy and camaraderie available in such activities. Thus, enjoyment and safety – not the level of skill – are the major considerations. Among the recreational athletic activities included in the intramural program are basketball, volleyball and flag football, as well as various one-day individual competitions. Other activities can be arranged, based on the interests of students, faculty and staff.